The blog has been a bit quiet recently, so I thought I would post a brief update with a melange of things. I was in Las Vegas for the first time last week for a medical convention, but not for me, it was my wife's convention. It was interesting being the spouse, especially at a Psychiatric convention. Enough said! Las Vegas is a fascinating place, a sort of must see, I suppose. But I have been there now so that is probably it. I did find a $3.95 breakfast place with $1 Bloody Mary's so that was good for the first 2 days, but after that things palled, I rented a car. I had not been to the desert for more then 10 years and I forgot how cool it was. So all and all worth the trip. I got in a second game of Longstreet last Thursday, it is a great game. Myself and Adam started a campaign and I got sort of trounced as the Union, but I am sure things will improve. You can see the AAR on Adam's blog. It is an enormously entertaining game and I am looking forward to the next game in what I think will be a 9 scenario campaign. I like the game so much, that I am presently negotiating with Fernando to paint a 15 mm Union army for me with Blue Moon miniatures. I am not too keen to paint 15 mm again, and I have been curious about painting services for some time. Well three weeks left and 600 points to go, I just do not think I am going to do it this year, but I will press on. I will have been away a total of 3 weeks of the contest and worked almost the full week of Xmas, so I think in retrospect that 1500 points was a bit ambitious. I do though have the rest of my Paratroopers on the table as well as my submission for the next fortnight bonus round (thank god for these bonus rounds). I have also received the rest of my Winter War Finns, as well as another 100 points of FIW figures for my Muskets and Tomahawks Warband. I also forgot that I had several Napoleonic skirmishers primed for Sharpe Practice, so the gristle for the mill is available. I am hoping to get in Longstreet and Chain of Command games in the first week of March and then it is off to Montreal for a much anticipated second game of Muskets and Tomahawks on March 16th. And most exciting of all is my son Simon thinks he might be able to swing some tickets for the Habs vs the Senators at the Bell Centre on the March 15. I have never attended a NHL game, so the thought of it is pretty exciting. Congratulations on the hockey win! Great teamplay and superb defence all the way. Would have been great to play against you guys in the finals too, but I guess we have to settle with bronze this time. Been wanting to try Longstreet myself too now that we have an ACW project going on at my club. Thanks for the link to the AAR! Thanks for the link to my AAR John. 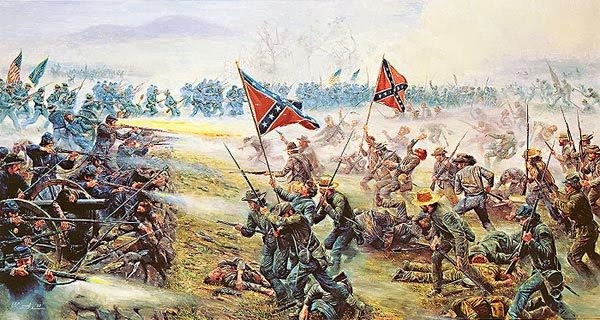 I too had great time playing Longstreet it is one of my favorite wargames of all time and I look forward to carrying on the campaign with you. Heard yesterday : "Daddy, daddy, what is a Hockey silver medal?" Pretty awesome performance by our boys and girls! I have Longstreet and it does seem excellent. Would love to try it one day. And see you in March! Hopefully by then I'll be able to walk a little! I have yet to travel to Las Vegas, but probably will sometime in the next year or so, as my God daughter is teaching there as part of Teach America. I suspect that will be enough for a lifetime, though! Oh on other topics. Great post. I also really like the Longstreet rules - i find them to be as easy to play as Black Powder but give a better "feel" for the period. Bah Humbug who needs Canadians anyway oops you have oil - never mind LOL - Glad your gaming again I kind of went on a hiatus myself - is Longstreet playable with 28mm and how would it convert to Napoleonics? I like the simplicity of Black Powder but workability for Nappys is a bit rough of course Empire III was far worse.